The Eastside Restaurant is a staple in Newport, Vermont. Positioned on the banks of Lake Memphremagog, this restaurant has been the destination of many locals, our Canadian neighbors, and area visitors for years. One of my favorite things about the Eastside Restaurant is the restaurant itself. The décor has a nautical theme, with woodsy tones. A map of the International Lake (Memphremagog crosses the Canadian border) adorns the wall of the pub, as do porthole windows, and anchor accents. But the dining room is softened with strings of twinkle lights, and by the fantastic view of the lake from the wall of windows. The ever changing mural framed by those windows is one of the best restaurant views in the Kingdom. 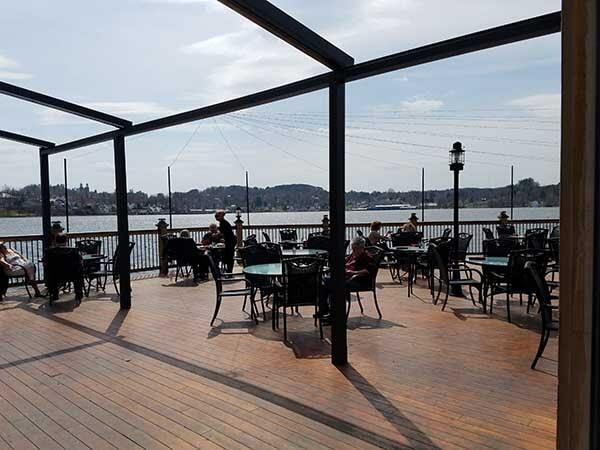 Summer time brings the opening of the deck, providing waterside dining. Events and live music are often booked to take advantage of the space during the warmer months – and with its own outdoor bar, it is a perfect location to spend the evening. Something else I’ve noticed about the Eastside is the calm atmosphere. Even when the restaurant is busy, which it often is, the dining areas seem calm. The layout adds to the easy flow of traffic, and though the staff may be crazy in the back of house, that doesn’t often translate to the front of house experience – that is a wonderful accomplishment in Kingdom dining. I have been coming to the Eastside for over 15 years. They have gone through a number of changes, but more recently I have been impressed with menus that include inventive dishes. These, combined with seasonal and more ethnic specials, have really made the restaurant more modern while traditional American favorites have remained on the menu, offering appeal to a wide range of ages and demographics. There is really something for all tastes at the Eastside. On a recent visit my husband and I brought a guest with us for dinner. The weather had already changed and fall was well on its way out, as the icy sleet/snow mix reminded us. In the cozy glow of the pub we stayed warm, starting our meal with our favorite cocktails – a cosmopolitan and vodka martini. To start, we ordered the calamari, a shrimp cocktail, and scallops wrapped in bacon from the appetizer menu. 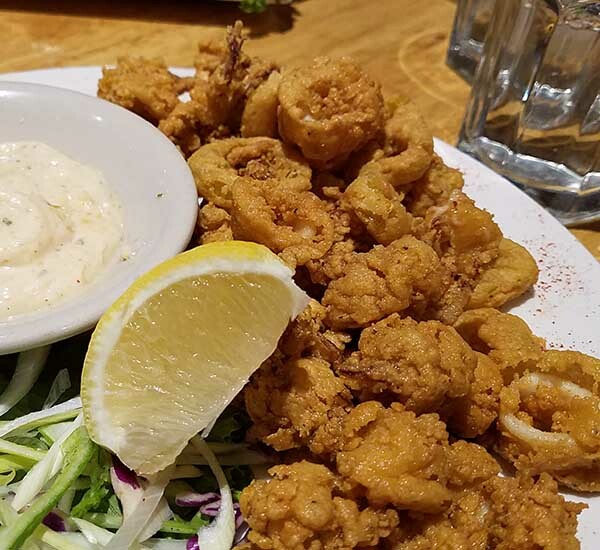 We are fans of calamari, and these didn’t disappoint. They were well cooked and the batter was crunchy and seasoned. The fried banana peppers mixed throughout added a little zing. This dish was served with a spicy mayo. This was my least favorite part of the dish, as it tasted too much of mayonnaise – A little squeezed lemon juice was all I needed. The shrimp cocktail was tasty as well, but the star of our app trio was the scallops. 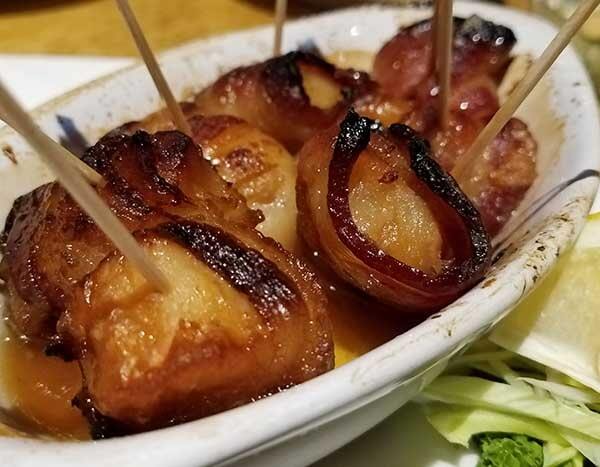 There was no skimping on the bacon here – each scallop was completely wrapped in its crispy deliciousness. The dish came with 6 scallops, all drizzled with maple syrup, providing a sweet counterpart to the smoky bacon. There is just something about the combination that keeps this dish a classic on menus everywhere. 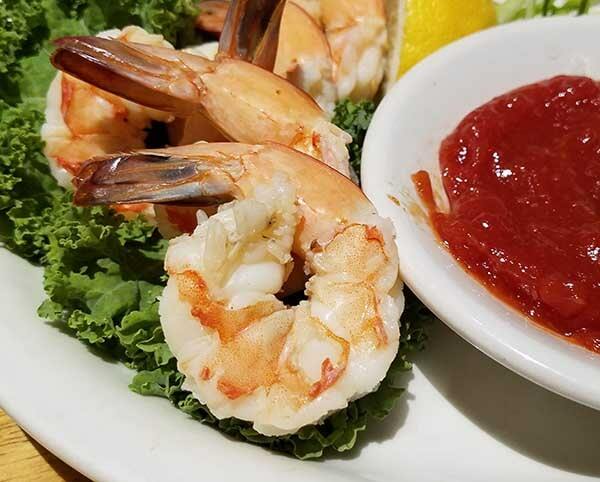 In keeping with the nautical theme, the Eastside is known for its seafood selection. I choose the seafood ravioli as my entrée. Our guest went with the crab stuffed haddock, and my husband ordered The Landing Ribeye. The ravioli was served with a sherry cream sauce filled with other seafood. Large chunks of lobster were easily discernible in the sauce, as were scallops and shrimp. Typically, seafood raviolis are mostly artificial crab meat and white fish. Not here. Lobster, crab, and shrimp were all to be found in the filling. The cream sauce was decadent with the sherry adding a sweetness that paired wonderfully with the seafood. The ravioli was a little on the chewy side, a common occurrence in frozen pasta, but the overall dish was fantastic. Our guest’s haddock was also delicious. Perfectly cooked, each flaky bite was accompanied by a mouthful of crab stuffing. 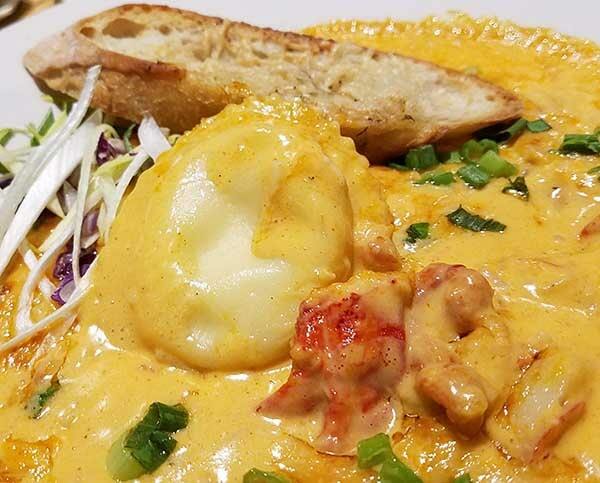 Chunks of crab lent flavor to both the stuffing and the cream sherry lobster sauce that covered the dish. The haddock’s light taste was the perfect canvas for these additions, and its delicate flavor wasn’t lost. The biggest surprise of the night was in the steak dish my husband ordered. Steak is a tricky beast. Often, when ordered in a restaurant setting, we have found steak to be under seasoned. But not at the Eastside. Cooked in garlic butter, with salt and pepper liberally added, each bite was bursting with flavor. Cooked to medium temp., with a beautiful char on the outside, we were all impressed with this ribeye. 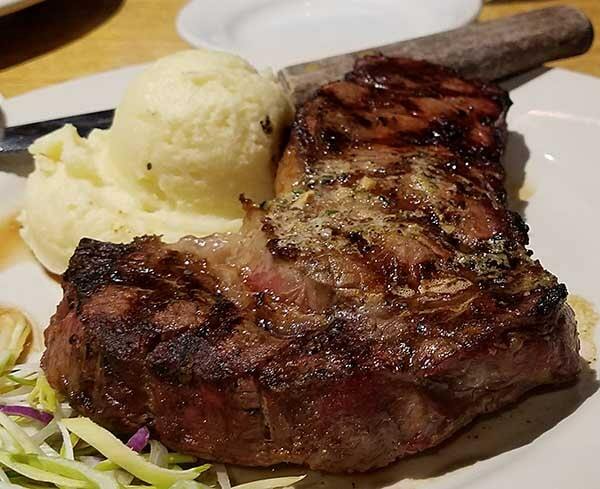 The side of mashed potatoes was a little under seasoned in comparison, but were the perfect thing with which to mop up the steak juice from the plate. All of the entrees came with the salad bar – this is something I love, as I am a vegetable gal. Starting my meal off with a hearty salad makes me feel less guilty about ordering more fattening entrees. The produce at the Eastside’s salad bar is high quality. Leafy lettuce is used in place of Iceberg – an important distinction for me. And the vegetables all are fresh and vibrant in color. I enjoy the warm bread, and that they include pasta salads, potato salads, and marinated olives as well as the vegetable options. To top it all off, a daily soup is also available on the bar. The portion sizes are quite large at this Newport restaurant, and on this occasion there simply wasn’t any room for desert. We all left with fully bellies and takeout boxes. So, I can’t leave out some other special things about this restaurant. One is that they have a large Sunday Brunch Buffet, one of the few left in the Kingdom, and it’s complete with bar drinks like mimosas and bloody Mary’s. 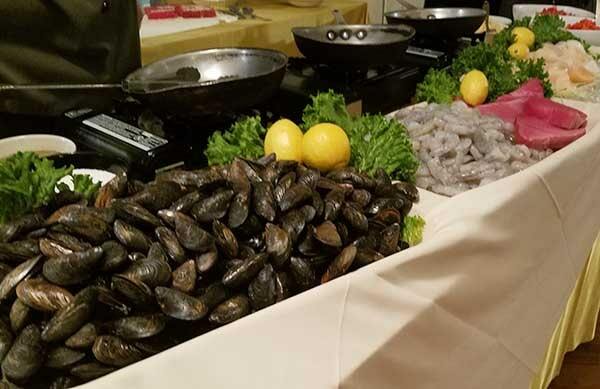 Other buffets appear throughout the year like their all you can eat seafood buffet (traditionally held in the winter months and for special holidays), and the annual Thanksgiving Buffet. They also offer event space and catering. But, a unique addition to this restaurant is its shops – Giftwrecked, Ladies Boutique, and the Bakery. They offer a number of souvenirs’, boutique style clothing, jewelry and beautiful craft items. It is also a great way to spend some time while waiting for your meal, or to burn off a few calories after dinner. The chocolate counters, filled with fudge and candy, are tantalizing – even after a large meal. We walked away with a box for later enjoyment…but, who can blame us!